There are many prepackaged food items that are cheap and easy to prepare if you don’t have time to put together recipes for your backpacking meals. Below is list of items that can be taken backpacking and hiking with little or no preparation, most of which can be bought at any grocery store. You may want to repackable the items below in a zip lock bag to get rid of weight and space. If you are going on a longer trip or want slightly more gourmet meals, you can use Wild Backpacker’s collection of backpacking recipes or bring packaged dehydrated and freeze-dried meals, like Mountain House or Backpacker’s Pantry, from stores such as Wilderness Dining. 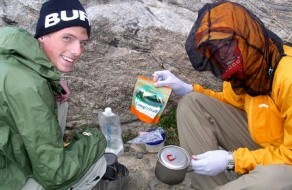 Have suggestions for pre-prepared food items while backpacking that aren’t included in the list below? Comment below and share your ideas!